The Places example demonstrates how to search for Places. In particular it shows how further information such as reviews, images and related content can be retrieved. Refer to the documentation for each of the geo services plugins for details on what plugin parameters they support. 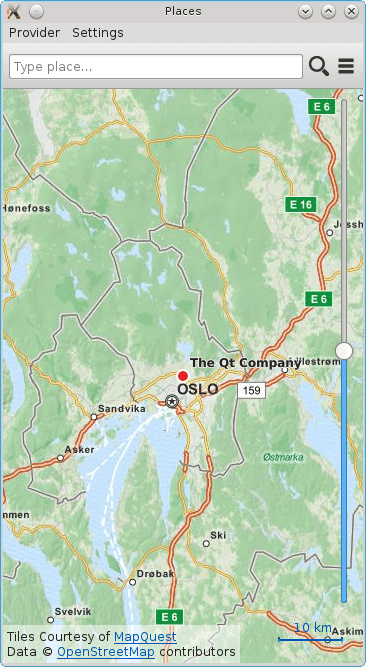 The default plugin used by this example is Qt Location Open Street Map Plugin, which does not require any parameters. The Places example presents an application window displaying a map. At the top of the window is a search box, which is used to enter a place search query. To search for a place enter a search term into the text box and click the magnifying glass icon. To search for a place by category, click the category icon to display the list of available categories and select the desired category. The place search query will be for places that are near the current location shown on the map. For some plugins like Qt Location HERE Plugin the search box provides search term suggestions when three or more characters are entered. Selecting one of the suggestions will cause a place search to be performed with the selected search text. Clicking on a search result will display details about the place. If a places has rich content (editorials, reviews and images), these can be accessed by the buttons on the details page. To find similar places click the "Find similar" button. The geo service provider can be changed by accessing the "Provider" menu. Before search by category can be performed, the list of available categories needs to be retrieved. This is achieved by creating a CategoryModel. The CategoryModel type provides a model of the available categories. It can provide either a flat list or a hierarchical tree model. In this example, we use a hierarchical tree model, by setting the hierarchical property to true. The plugin property is set during example intalization. Next we create a ListView to display the category model. Because a hierarchical model is being used, a DelegateModel is needed to provide navigation functionality. If flat list model was being used the view could use the CategoryModel directly. The rootIndex property sets the root index of the DelegateModel. Categories are displayed by the CategoryDelegate, which provides two signals. The onShowSubcategories emits the showSubcategories() signal with root index to the current index causing the sub categories of the selected category to be displayed. The onSearchCategory handler emits the searchCategory() signal with a category parameter indicating which specific category has been chosen. The CategoryDelegate also displays arrow ToolButton when hasModelChildren property is set. The PlaceSearchSuggestionModel type is used to fetch suggested search terms based on a partially entered search term. A new suggestion search is triggered whenever the entered search term is changed. Suggestions are only queried if the length of the search term is three or more characters. When the status of the PlaceSearchSuggestionModel changes, search suggestions are displayed. The main object in the "SuggestionsShown" state is the ListView showing the search suggestions. A Label object is used as the delegate to display the suggestion text. Clicking on the suggested search term updates the search term and triggers a place search using the search suggestion. The PlaceSearchModel type is used to search for places. First some of the model's properties are set, which will be used to form the search request. The searchArea property is set to the searchRegion object which is a geocircle with a center that is linked to the current location displayed on the Map. Finally, we define three helper functions searchForCategory(), searchForText() and searchForRecommendations() which set either the categories or searchTerm or recommendationId properties and invokes the update() method to start the place search. The search results are displayed in a ListView. Places can have additional rich content, including editorials, reviews and images. Rich content is accessed via a set of models. Content models are generally not created directly by the application developer, instead models are obtained from the editorialModel, reviewModel and imageModel properties of the Place type.